So what does that mean? It can mean many things to people depending on who you think you are and what you think you are not. Oh my, what a journey this has been and continues to be for all of us. So much to look forward and, for many people so much be fearful about. So which road do we choose? The road that makes us feel good or the one that continues to cycle in a state of worry, fear and bewilderment. After deep though about this question, and a willingness to come from a heart-centered space of love, I choose looking forward happily to the next part of the journey. What good things are on their way to us? I like the way that makes me feel, it embodies happiness within and a positive spin on life. We can then embrace the unknown with mystery and excitement. Who said there is rule book? Why can’t we decide on what we want to experience for ourselves? It is a choice about how “we choose” to experience “OUR” life. What will we choose? The choice will unveil itself into our many life experiences running the gamut of emotions. Love those emotion… every bit of them. Be honest in expressing how you feel to yourself and to everyone else. Of course lovingly and with compassion- like you are talking to a young child who is in pain… because our inner child deserves that, and much more. Always being true to yourself it the one way to really love who you are. You are not responsible for how another feels, they are on their own journey. It took me years to get this idea alone. If a person hurts, love them. If they are mean to you, know they are dealing with their own demons and are doing the best they can. They are silently crying out saying “I don’t know how to love myself”. Give them time and space as you see fit. You may not agree with what they do, but realizing it has nothing to do with you, relieves the pressure we sometimes put on ourselves so often. Will certain people say and do things that are not from a space of love? Oh yes, but how we choose to feel in regard to what others say, says a lot about how we will then experience our life.., Love yourself no matter how you choose to you feel. So is this radical thinking? Love the radical mindset. Because when you love who and what arises you will see your inner world and outer world change before your very eyes For example; if you are angry – express I am angry because of __________. Love this angry one…or I am Sad because of________. Love the Sad one. Love What Arises……, be true to you the only one who can love you the deepest, YOU. The more you give yourself permission to unravel, and allow your feelings, the better you can honor and embrace your deepest being, love of others and the wellbeing of all. That is gift the world is waiting for…Living from this state of being can change the world one “I love you at a time”. Matt Kahn is a huge proponent of this mindset and I feel it is revolutionizing! “Everything is a blessing no how “bad” or “good” we may perceive it. Life presents itself to you for your spiritual development evolvement and consciousness expansion. Love that too! And if you can’t… love the fact that you can’t. In many terrible life altering situations- someone could be saying to themselves “my life has been terrible-financial disaster, relationship breakups, abandonment, abuse, illness; pick one or more or all of them, they are all terrible and I am not downplaying anything by any means. What I am saying is maybe these things occurred to somehow make us more aware of the fact we didn’t choose to live by our own choices but by the choices of others. Maybe, we gave our own power away because we didn’t feel safe, protected or confident in ourselves. Love the one who is not confident, feeling safe or protected. Certainty there may be other reasons for our actions and feelings, but these have been the most prevalent ones I have experienced in myself, my friends, family and clients. This is not about blame of any sort it is about exploring things from another perspective. It’s about opening another chapter in the book of life to now embrace what we thought to be true at one time, may now need to be revisited to help shift our mindset to one that is happier, healthier and more in alignment with our true divine nature. There is nothing wrong with questioning the prior assumption about anything as that causes curiosity in life. And, what a better way to live than to question, explore and expand the unlimited possibilities that the Universe has to offer. Here I am just sitting outside relaxing when some amazing occurs…. I closely watch as a squirrel so agile as he quickly scurries across the electrical wire, ekkk…it reminds me of a tight rope. I hope the little fellow doesn’t fall off. Wow, he did it… so easy and effortless. He does not appear to be concerned about falling off, in fact he just went about his business. Agility, I am sure comes easily to these amazing creatures, it is habitual and instinctual. After witnessing this great feat I begin to daydream a bit. I am thinking about all the new changes I want to make in my life. I feel as if I am transforming in so many ways. How could so many things all be going on at the same time? Should I be concerned? Maybe I should be, but for some reasons I am not. Could I finally have reached a point in my life that I am ok with what happens and with my decisions thus far? I am tired to wasting my precious energy on trying to control everything, I have come to understand it is not my job to make everything go according to a plan. What is the plan anyway? It is my plan? The divine plan? Someone else’s plan? It doesn’t really matter. Life is not about controlling everything around you I have found, it’s about being in a place where you are responsible for “your” actions, words and thoughts and making decisions that align with your deepest truths. That is a mouthful of words but it is filled with enormous wisdom. A wisdom which we all have within us. I am approaching things from a calmer perspective. I finding my life is much peaceful. I never really thought like this, so I can’t help but question myself, Janet are you giving up? My answer is firmly “NO”. Well, then what the heck made you change? I believe is emanating from a variety of life experiences. It has taken me 55 years to feel this way and that’s ok with me. Has your life offered new ways for you to realize things that help shift in some way? Have you transformed your mindset with new perspectives and perceptions? I bet it has if you really took the time to think about it. Just like the squirrel scurrying along with a sense of ease and instinct we too can live our lives with ease just by listening to our intuitive nature and following the flow even during the many challenging “tights ropes” we encounter. It feels like a million years since I have been on by blog. To my devoted followers my apologies as I was on a mission to finish my book. Finally my labor of love is done and published. 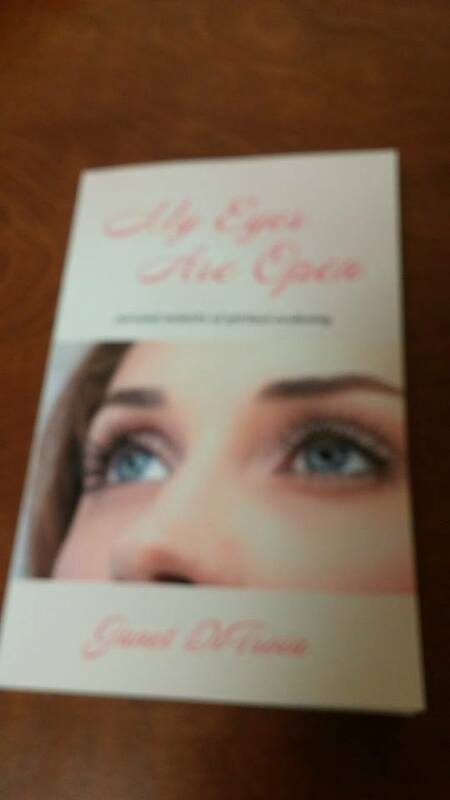 “My Eyes are Open” telling the story of my spiritual journey; a road well traveled with fear, courage, determination, awakening, self-love, compassion, aha moments in realizing my authenticity, and enlightenment. I found it so empowering to get to know who I am all over again as if I never experienced it before, but this time through new perspectives and perceptions that dramatically changed the program of my limiting beliefs, negative emotions, and insecurities. The difference is now I look with my “eyes open”. From this more “Awakened” and “Conscious” perspective see that life takes on new meaning, and throughout the book I elude to my many new ideas and strategies that have help to light the way from a road of almost darkness to a road of light, love and peace within. I am blessed to share what I have come to understand about myself and about the world around me. Because now I have pressed the reset button, changed the channel and opened up a world of new opportunity. Valuable an Impenetrable you really are…just because you are YOU! A distant friend of mine once said: “A way to step up to prejudice is to walk around blindfolded.” I found those words to be compelling and eye opening. I thoroughly enjoy exploring these ideas further, what do you think? Walk with me and imagine how different things could be. Our world would massively CHANGE without our sense of vision. All the stereotypes, judgments and perceptions we carry around every day would be dramatically impacted upon. Just think, all of our thoughts, words and actions would take on new meaning. If we couldn’t see the color of a person’s skin, the clothes their wear, if we didn’t notice their body language and natural gestures we would have to rely on the quality, intonation, pitch and intensity of their voice. Instead of being clouding by our misunderstandings or limited perceptions and beliefs; I believe their words would have a much deeper meaning. knowing that, we would listen more attentively rather than passively as many of us unconsciously do. Do you realize that when a person can express themselves more effectively this would instill a feeling of consistent confidence within…as you would say to yourself “what I have to say is important”, therefore I am important? Do you realize what a powerful and liberating feeling this would human beings? Being acknowledged for what you have to say is so satisfying because you know you are listened to with a deeper sense of understanding. Doesn’t this blow your mind? People will get you! There would be much less reason for misunderstandings and confusion. The need for war, violence and a breakdown of the human spirit would not even be thought of, as we would understand each other more fully, therefore we have no need to “want something or someone else” to attain our own sense of well being. We would all be very confident in our mind, body and spirit, loving ourselves just as we are. We would emulate a sense of self worth and have no need to hurt another to gain “something else”. Because when we have the need to “hurt” someone it only shows the cry for help within ourselves, as we lack the true understand of who we really are. Feeling deeply and completely loved as a young child maybe; just maybe throughout the transition to young adult hood we would not turn to addiction to fill the void within ourselves. Kids would not be cruel to one another because they would already realize how their words and actions can damage someone else’s young spirit. Even people who have positions of authority could send their messages with truth and honesty demonstrating value and purpose. Then, the once thought of blinders of greed, money, and anger would not cross anyone’s mind because we would all live and love knowing true power and happiness is a choice and not a something to be “attained,” as it already resides with on us. Do you wonder how the world would look? The paradigm shift would be enormous, and the domino effect would unravel so many life altering disempowering patterns we have developed for ourselves. Doesn’t this sound live heaven? I think it does. But I also know we don’t have to wait to get there. We can create a story for ourselves, one that we are proud of, and one that make us feel empowered, happy and peaceful. You can stand firm in your power and confident to make choices that make you feel like you are living what you meant to be here for; love, compassion, peace, wealth in all aspects of life, joy, etc… Those are things that make you feel good, and when you feel good on the inside you will glow on the outside. People will take notice and your life will change, I can guarantee that…. impact your mind and body in ways that diminish your happiness. Instead, walk in your own grace and shed your brightest light in a most powerful way. Living with crystal clear clarity it amazing! It will be refreshing, rejuvenating, and gives a journey that eloquently directs you on a path of fulfilling your dreams, goals, and deepest aspirations. I cried myself to sleep so many times I’ve lost count. Although I remain to be a very upbeat joyful positive person most of the time, there are occasions when the little girl that resides within me cries out for someone to look, understand and accept her for who she really is. She wants someone to take care of her, love and respect her, and treat her with a sense of grace and dignity. It’s hard to explain all the details and underlying reasons for this, I just know it was emotionally painful for a long time. How on earth could I have the felt less than who I really am? Why does anyone think less of themselves? Where on the path did I pick up these lies about me? Why the heck did I believe them so darn long? There is really no blame here, just awareness. This awareness has led me on a journey to find out why and what is really happening inside of me. I now understand that the real answer lies in how I look and feel about me. How do I look at myself in the mirror everyday? How does the outside world see me? When I love me, respect me and take care of me, those inner negative feelings disappear; they melt away, just like ice on a hot day. If I see myself as “fat’ the world sees me as fat. When I berate and criticize myself the world does the same. Do you ever call yourself stupid or clumsy? Do you berate yourself without realizing it? It’s a terrible way to view one of God’s most precious assets. YOU! Would you berate a child, and criticize them.. tearing away their self esteem with harsh words.You would be helping them to believe they are not worthy. That is exactly what I was doing little by little.. Not an empowering way to live life is it? We in a sense are truly children, children of a higher power and it’s hard to thrive when we beat ourselves up on a daily basis. Now I know better. Love yourself just as you are. What ever we feel about us or anyone else all comes down to energy patters that can keep us in or out of balance within our mind, body and spirit. We can either feel wonderful or we can replay that viscous cycle of negativity and disharmony with us. We are energetic beings, and our thought and feeling patterns vibrate at certain levels. If I do not accept myself on the inside, I send those vibrations out to the world, I don’t even have to say anything, all I have to do is feel this in my emotional makeup, and these vibrations are then picked up by other people via a complex energy system which resides in our being. If you really want to delve into this further, there is a wealth of information that explains in further detail. For purposes of this chapter I will only defer to just one way of attracting good things in your life. Certainly other things exist within the principles of the Universe but I just Want to keep this easy to understand. The “Law of Attraction” is just one example of how we attract what we are… The premise is that you’re going into the universe and you attract what you think and put your focused energy upon. Change your thoughts and you can change your life. When I began to feel more positive about myself and about things in my life, I attracted happier circumstances. This led to more opportunities in my career, better finances, a healthier well-being and more meaningful relationships. Your world slowly starts to change from inside out because you’re focusing on the things that really matter and not the outside circumstances. We are an “inside jobs’ so to speak. What resides on the inside, deep within our subconscious plays out as our present life reality. We have been so conditioned to looking at everything on the outside we base our life on only what we can see, what is visible to the human eye. That truly is a big misunderstanding. Your outside represents what you are thinking and feeling and it then comes to you through our many experiences. If you want to change your life, you have to change your inside script, the thoughts, feelings and the energy you give to the. It would make the most sense to create thoughts that are in your highest good and best interest. This takes time, effort and a determination to truly find out how and what makes you tick. Are you willing to do that? Are you at a point in your life where you are not fulfilled? I was. So I took the time and perseverance to find out why? This book will detail in many chapters the ways I made changes to create a better life. Finally, one that I was much more proud of..
Do you maintain healthy thought patterns? “Life isn’t about finding yourself, it’s about creating yourself”- I’ve heard that quote many times and it makes perfect sense now. Step up and make a healthy choice, you deserve it. Or, you can just react to everything that gets thrown at you. When you live from a place of creating what you want,, your reality will change. Find out the reasons that you may be feeling miserable, sad, rejected unhappy etc. Accept it for what it is, then make a PROMISE yourself to forgive yourself and everyone else along the way. This is probably one of most life changing things. After that learn how to let all the past go. Don’t hold onto the past baggage it only weighs your heart, mind and body down. You will create a much happier and emotionally healthier you! Talk about FEEEDOM.The sense of peace you will get from releasing and opening your heart to new ways of thinking, living is amazing. Today and most days I am excited, open minded, funny, and so much more loving and compassionate, not only to me, but to others I touch. Once you understand this, you’ll have the potential to affect your health, spirituality, relationships, finances and overall emotional and physical well-being. I first learned this when I listened to a few seminars about mind and the body relationship. I also took time to read about the principles that guide this universe every day. I learned how vibrations are in everything that exists. I learned that even a cup vibrates. Our hands, fingers, etc. all have vibration-“we are energetic beings’… How cool this was to learn. By no means do I claim to be well- knowledge in physics, but I found these things to be mind- blowing to say the least. One thing that really stuck with me was that our words, our thoughts and our feelings vibrate. There is much information available to anyone on energy and vibration of the body. Many books on the subject exist and I just kept reading till I understood the basic concepts. Wow this stuff really makes you think. High vibes, happy and healthier life…This makes sense. Today I watch very little TV unless I feel it presents healthy vibrations that I want to resonate with. I listen to music that also holds higher levels of vibration. I spend time with like-minded people as my friends are an important part of my life. Your life is a result of what you choose to resonate with….How do you think.. you vibrate? Just look at you finances, relationships, and spirituality, physical and emotional well-being? All of which are a direct result of your thoughts, feelings and actions. It provides a clear picture of how you vibrate. The great thing here is… YOU CAN CHANGE IT IF YOU WANT TO! I desperately wanted to and I did. You can do this if you are committed to wanting a better life for yourself. Now you can be happy and that is what we all desire. Consider opening you heart up to change….Release the resistance to making changes, and now the door of opportunity awaits you. and you will be amazed at the results.. When I meditated I began to get in touch with my spirituality, my sense of self opened up, I had many inner conversations with myself. I asked questions and I got answers. Why was I so scared? what did I have to loose? So many roadblocks existed within me..ones that I didn’t realize I created. It’s time to get our of you own way.. We consistently block ourselves from the good we all deserve. This in not on purpose, we just have faulty patterns within us from the past, so the time for change is now.. It was NOW time to find out answers. I had so many references (old stories playing inside myself) telling me I wasn’t supported. I had this feeling that I was on my own, with no help from anyone. Do you ever feel like this? I now know that could not have been furthest from the truth. We are always surround by life and love, it is only when you come from that mindset will you realize this truth. As a young girl I did not see my parents support me in emotional ways, as a teenager my confidence was so beneath the layers of shame and lack of self-love; I did not feel supported in any way. As a married women I did not feel emotionally supported by my husband, many times I felt alone in my decision making; just coping and wishing someone would listen to me and want to hear what I had to say. I am sure this may sound familiar to many of you. Or, are you blocking you own way and denying yourself of your own feelings? Are they so repressed inside safely hidden? That way you don’t have to deal with the pain an hurt that may come up. Believe me I know this place, and I had to go there because I was not giving up on me anymore… I wanted my answers.. In the world we live we become so conditioned to just following everybody else’s cues, we lose sight of our own values and worthiness and what feels true to us. We may think this is a safe place, but it is not. It is a false sense of security. During your lifetime I hope you come to a point when you just know there is more, that to me…is the beginning of an awakening., Your soul is yearning for more,, please listen to it, be attentative to it,, but most of all…. Early one morning, I awoke sweating and shaking. I wasn’t sick but I did feel nervous. It wasn’t something I could put my finger on and I started to cry uncontrollably. I had no idea why. So I sat (something which I did very little of in life) and I asked myself “what’s wrong Janet?” I waited and waited, till I heard a response, then calmly the answer came to me, that little voice in my head said “Janet you are MISERABLE and UNHAPPY, and this is not the way to live your life anymore.” I had really forgotten what it was like to laugh, relax and just enjoy life. Somehow, I was lost in the confusion and I felt like I was in the dark with no way out. I went on about my business that day, but kept thinking how I felt earlier that morning. A few days went by and the same experience repeated itself again only much more intense. I tried to figure out what was in my mind, so I sat quietly for a few days in the morning, midday, and at night prior to going to bed, hopefully waiting to see what would reveal itself to me. I went through a host of possibilities. First, I thought it was external circumstances, for example, maybe I should move to a new area. Yeah, that’s it, I will go to another city or state. Wait, I can’t leave my children or family, how would they manage without me? Next, I thought, maybe it’s my friends yes that’s it. They are not good influences on me, so I can say goodbye to them and then meet new people. Yes that would make me feel better about me-I could then surround myself with people who are much happier and enjoying their lives better than I. However, as I looked around my world I could not find any people who were truly happy, in any sense of the word. “Happiness if overrated”, I thought. After all I had good friends and family who love me, a good job and a place I could call home. What the heck is wrong with this picture? Yet there was something missing. I couldn’t put my finger on it. Does this sound familiar to you? Does it seem like something is missing in your life? I was at my current occupation for about 25 years, maybe I was burning out, okay I will consider switching my career, go back to school and do something different. As I thought it through, reality crept in. I have to make an income to support myself and my family, this is not a good time to go back to school. Not a good idea. Everything I thought and did felt wrong, my gosh how did I make so many mistakes? I even had a wave of anger come over me, so out of character for my personality I thought. So I told myself “STOP feeling angry Janet.” But at times you feel angry about sometimes and you may not know why.. but it’s wrong to feel angry! I have to stop this.. I have to feel happy. Have you ever felt like this? You feel like you are second guessing yourself. There are so many curve balls thrown to us in life some of them are happy ones and some of them are not so happy. And that’s okay. Now that I look back on the experience, I probably should have asked myself why I was feeling angry, upset or out of sorts.. and maybe, just maybe it could have opened some doors at the time. Now as I go back and look deeply within myself, I see I was my own worst enemy, my own critic, I was allowing this critic to call the shots and I listened thinking it was the right thing to do. Somehow, my inner critic, the inner voice that we all have is telling us things that are furthest from the truth about who we are..this was my truth at the time. I allowed it to tell me: “you are not good enough or just not lovable, you’re overweight, not beautiful and insecure”, who would want you anyway? even your husband rejects you “feelings of misery, sadness, and despair took over my very being at that moment. It felt like a knife was crushing through my heart and the emotional pain was devastating. I’m sure that many times in people’s lives they may feel this way, but for me it was enough to catapult me forward to want to know why, why was I feeling this way? Oh my God where is all this coming from? I realized it was coming from a place of deep emotional pain. My intuition or as I call it my God sense was stepping up and telling me it was time for significant change, it was telling me I cannot live this way anymore or I will not emotionally and physically survive. Wow…That was enough for me to make a decision that I wanted my life to be different, much different. I decided to venture out on a quest, a soul-searching adventure. I would stay up until exhaustion many nights; I could not sleep anyway, so I took the time to read, research and learn about what was going on inside of me. I went from the link to link, website to website, reading articles, journals, inspiring words of wisdom by many well-known individual such as Neal Donald Walsch, Louise Hay, Wayne Dyer, Deepak Chopra, Rhonda Bryne, Marcy Shimoff and many others. When if would read and it helped to lead me to a place of peace and stillness within myself, I knew I was finding my answers piece by piece. Have you ever been on a mission that you had to find answers about something? You become determined wanting to know the reasons why something is..so you get on a mission; an intense path to find the answers. So, yes I was on my mission and I wasn’t giving up until it was satisfied. I literally took every waking moment to feed this insatiable hunger for answers. I would not give up for anything or anyone. If it meant reading every book I could get my hands on, I would do it! I read books on self-love, spirituality, changes of life, health and wellness, psychology, energy medicine, physics, finances, and God knows what else. I even read books about how to make a lot of money, and live a life full of dreams. You name it, I picked up the book. I also traveled by myself, (truly out of my comfort zone) to listen to do inspirational speakers which would help me better understand what I was feeling inside of me. I visited sacred places, not only in person, but in books on audio tapes and in my imagination. I just had to make sense of why I was so unhappy. Over time, I slowly put the pieces of my heart back together. I took copious notes and then taped myself listening to myself reading my copious notes, oh geez, was I falling apart or as I like to think of it now… Falling back together. When you’re thirsty you get a drink, when you’re hungry you get something to eat, but when your heart cries out for answers you take whatever measures are necessary to fill that hole of emptiness. I was on a mission, a mission of the soul. I’ve always considered myself a person interested in learning about things, asking questions and looking into solutions, but never in my wildest dreams could I ever have imagined I would’ve reached such a point of desperation. I would literally eat, drink, and sleep this newly learned information. I finally decided following a path of self-love, not just your basic love, if there is such a thing. Unconditional love of myself..no strings attached! Have you ever asked the question of yourself do I love me? Many people do not truly know how to answer this and I did not. So it was time to take a journey on the inside.. I found this to be a bit of a frightening, God knows what will be revealed, but as I said I was on a mission so I was ready to find out, and find out I did. What deep-seated feelings and beliefs could you uncover about yourself? What with this feel like? For me this was not an easy thing to do, especially when you’re frightened of what you will find out about yourself. Have you ever had feelings like this? It’s not a fun place to be. I found out I had to literally come out from underneath the covers were I thought I was safe, and take the risk of finding out what was really wrong. What was really bothering me? My heart was not a good place at the time; I continued to cry regularly. Every seminar I listened to and everything I wrote down in my Journal brought me closer, much closer to the answers I was seeking. My heart was pouring out such emotional pain, hurt, rejection, frustration and security and anxiety and every other imaginable negative emotion. And what I truly learned is that I had found a healthy was to release this emotional baggage and truly feel better. Have you ever felt overwhelmed and did not now how to handle all of the emotions? Maybe you felt backed up against the wall or maybe lost, lost in the confusion of your own trapped emotions. I thought hiding under the shell was safe that way no one could know how I was feeling. That way I wouldn’t have to step up to what really hurt. But as I continue to travel on this journey I realize I was a living a false sense of security. I have come to realize I was doing the best I could at the time. (just like you). Throughout my life I’ve always been the kind of person who wears her emotions on her sleeve; but this time it was totally different. everything seemed so much more intense.. so magnified that I had to take a step back, catch my breath and slowly put things back together piece by piece. I was truly unraveling the person the inner workings, the woman, and little girl inside of me. I let out so much pain I believe I dropped 50 pounds of emotional weight. Do you wonder how much emotional weight you could be carrying? Weight is not just about what we eat and how we exercise it’s also about carrying emotional weight and I can tell you from experience it is easy to put on pounds,, even if you think you are doing everything right, remember not to overlook this very important fact. On occasion I literally had to vomit to get out whatever was turning my gut inside out and fortunately this was very short-lived. However, little did I know I was now planting the seeds of growth that I would eventually cultivate and nurture the rest of my life. Somehow, I forgot all the things that were important to me, and how they made me feel. I had to remember what was real versus what wasn’t. And, I had to reflect on some tough questions. Questions like was it okay not to like myself? Was I pretending I was happy, when I really wasn’t. I believe many people do this every day to get by, do you? what are the different masks you wear to protect yourself, to hide behind the emotional pain? I challenge you to look in that mirror to see that reflection and start taking action into being who you really are- Do you realize you are deserving of happiness, joy, peace and a sense of self-fulfillment in every area of your life? Do you realize that it is your divine right to feel good and to love yourself and at peace? There are no strings attached here. please consider making a promise to yourself now knowing your so worthy of wonderful things. I had to look through the chapters of my life and the story I created for myself. Now it was time to rewrite a new story, a story that I can be proud of… A story that let me hold my head up high with love as my main emotion leaving behind all the negative stuff. When I think of all the things… I bought into about me, such misconceptions it makes me shake my head.. Now, I know much better.. Will you give yourself the gift of time, energy, commitment, and love, will you put the effort in to find out why you feel the way you do? Will you see that your truly deserve to have a wonderful life? Would now be a good time to get started? I believe it would.